The rapidconnect 12W Wall Mount Enclosure is designed to take a maximum of 24 Fibres using LC Duplex or LC Quad connectors or 12 Fibres will all other connector styles, with a variety of face plates on offer you’ll find what you need. The rapidconnect 12W Wall Mount Enclosures provide efficient and organised cable management. This allows for fast and easy installation. A record book to keep track of all cables is also provided. The rapidconnect 12W Wall Mount Enclosures come with a variety of connector face plates; ST, FC, FCA, SC Simplex, SCA Simplex, SC Duplex, SCA Duplex, LC Duplex, LCA Duplex, LC Quad and LCA Quad. 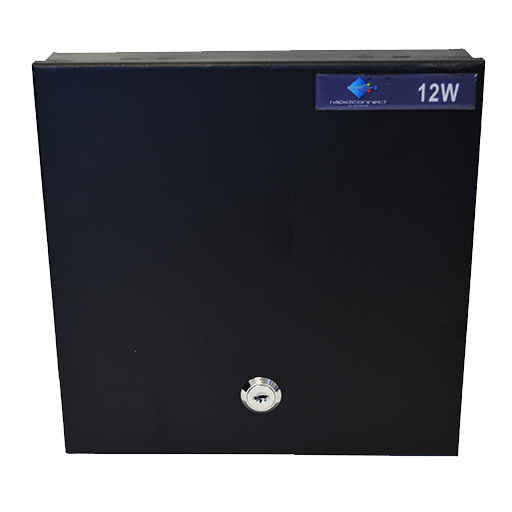 All rapidconnect 12W Wall Mount Enclosures are manufactured with a lockable door to assure secure cable storage.. The rapidconnect 12W Wall Mount Enclosure is compact in order to optimise the use of confined spaces. The rapidconnect 12W Wall Mount Enclosure is designed to take a maximum of 24 Fibres using LC Duplex or LC Quad connectors or 12 Fibres will all other connector styles to suit what ever your needs. The lockable door protects and ensures little to no fibre disturbance. This prevents anyone easily accessing the fibres once placed and locked in the enclosure and gives you piece of mind knowing your install is safe.